As we approach the springtime, we are all very outdoor minded. You may be asking yourself now how you can spruce up your yard and your property this season to make time spent outside with family and friends more enjoyable. You might be considering cleaning up or even expanding your patio or adding new features to your yard. If so – and you want a more central outdoor gathering point – nothing beats a fireplace under the stars. An outdoor fireplace is something of a throwback to our ancestors telling stories by the fire beneath the night sky. The only difference is that you can do this now right in your backyard – a place of comfort and relaxation. Whether you have a classic fire pit or Mexican-inspired clay fireplace – a chiminea – an outdoor fireplace is an extremely wise investment. It serves as a natural gathering point for you and your guests and, weather permitting, it can be used year-round. Installing a fireplace is more affordable than you might think, and best of all they have very limited upkeep requirements. Thinking of something larger or that caters more to your passion for grilling? Some people opt to have a full outdoor kitchen installed. An outdoor barbecue pit or grill and kitchen will allow you to not just host your guests, but also feed them a delicious meal as well. Whether you opt for a fireplace or full kitchen, you’ll make your yard the place to be this summer and every season. 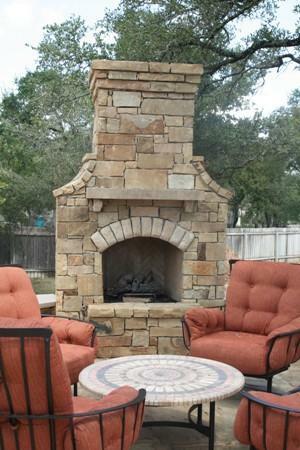 Crites Custom Pools offers outdoor fireplace, firepit and kitchen design and installation services. We work with every customer to understand their vision of the ideal outdoor space and work to create a custom solution that meets and exceeds their needs. We’ll work with the confines of your property and stay within you budget while designing and building an extra-special new space for you to enjoy outside. If you are looking to add that central gathering spot at your home in time for spring and summer, call Crites Custom Pools at 512-759-2630 and get started today.